I have a confession to make, until recently I’ve always been too intimidated to cook a ham. I like ham but there seemed to be a secret to keeping the ham moist and no one was telling me the secret. 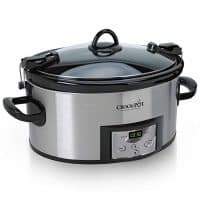 Well, I’ve found the secret and I’m sharing it with you….slow cooking….yep, that’s it. 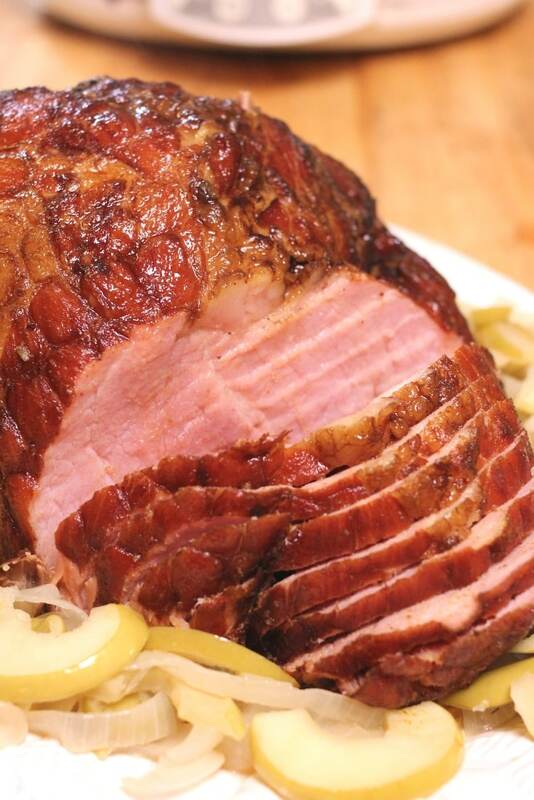 For a really moist and tender ham, you need to cook it slowly for several hours. 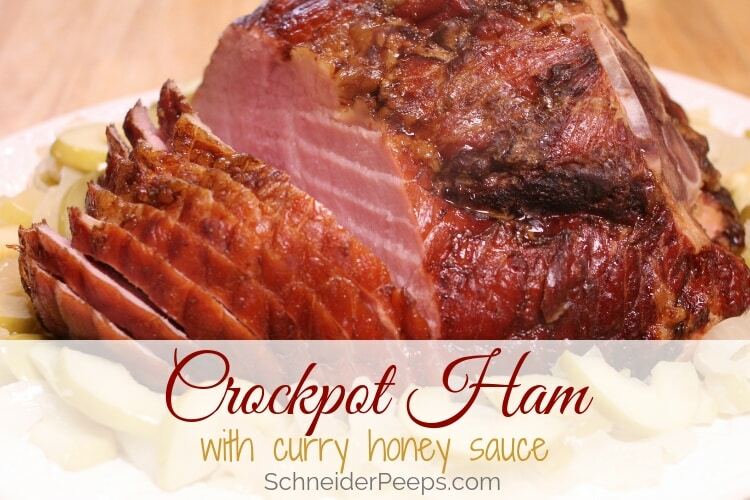 Since discovering this, crockpot ham has become a family favorite. There are a couple of days a week that we need to eat “fast” food for dinner – not from a restaurant but from home. On these nights we’ll either use some of our home canned stews, have breakfast for dinner, or have a crockpot meal. When Frick’s Quality Meats sent me a bone in ham as part of their Blogger Recipe Challenge. I knew I wanted to make the ham in the crockpot. Not only is crockpot ham good for a quick weeknight dinner, it’s also good for Thanksgiving when the turkey is taking up all the oven space. Since my ham cooking experience is minimal I went over to Frick’s website to get some tips. And they just happen to have a page on how to cook their meats. Frick’s meats are pre-cooked (and smoked) so there’s not a lot you NEED to do to cook a Frick’s ham. For their ham, they suggest combining the drippings in the package with 1/2 cup water and cooking at 325°F until the internal temperature reaches 130°F. Those simple instructions gave me quite a bit of confidence. I hope they give you confidence too. One of the things my family doesn’t care for in ham is a sweet, thick glaze. I know…that’s how they’re normally served and with good reason. The sweetness helps cut the saltiness in the ham, so most people serve it with a glaze of fruit juice, brown sugar, and fruit. But my family is weird and doesn’t like that. 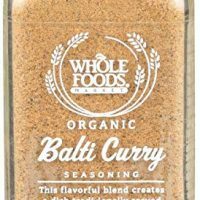 What we do like is curry seasoning. 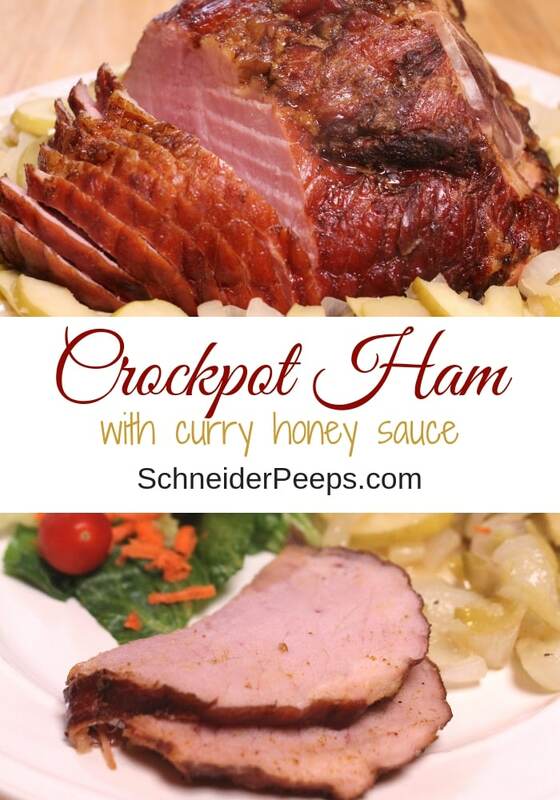 So we decided to cook the ham in a curry honey sauce in the crockpot. 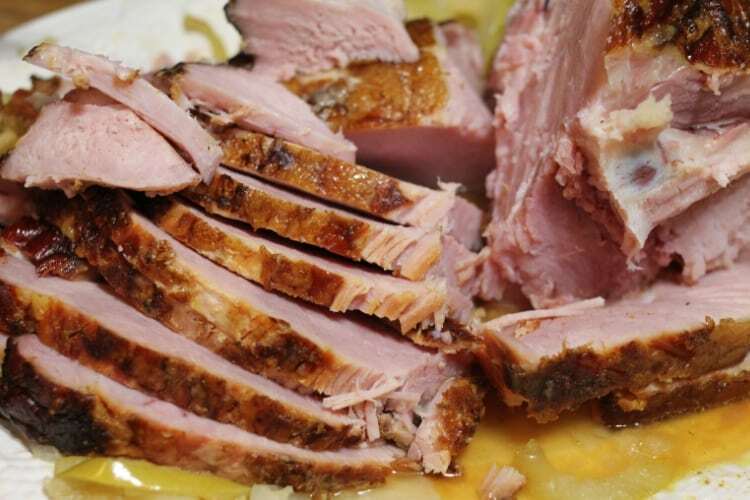 We’ve made crockpot ham several times and one thing I’ve noticed is that if we let it cook longer, say for 6 hours instead of 4, the ham gets really tender and falls apart like slow roast pork roast. The longer cooking also tends to remove some of the salty flavor from the ham, which means there’s no need for a super sweet glaze. For these reasons, my family prefers it when I cook the ham in the slow cooker for 6 or more hours. When the ham is done, I take it out of the crockpot and put it on a platter to rest. Then I put the broth in a sauce pan and reduce it until it’s thick. Basically, I just boil it until about half of the water has evaporated. While the sauce is reducing down, I make fried apples and onions. We first discovered this side dish in the Little House on the Prairie Cookbook. We slice a pound of Granny Smith apples and a pound of sweet onions and fry them in a few tablespoons of bacon grease. If you want to fry a bit of bacon first to crumble in, you can just use the grease from that. I don’t usually take the time to fry bacon for the apples and onions and just use bacon grease to give it a hint of bacon flavor. We keep a big bowl of salad in the refrigerator to use throughout the week. This helps makes the crockpot ham a really fast meal. The great thing about ham is that you can get quite a few meals from just one. Even if there’s no meat left after dinner, save the bone to season beans. We love cooking butter beans with ham bone for an easy winter dinner, serve it with a side of skillet corn bread you have a lovely meal. 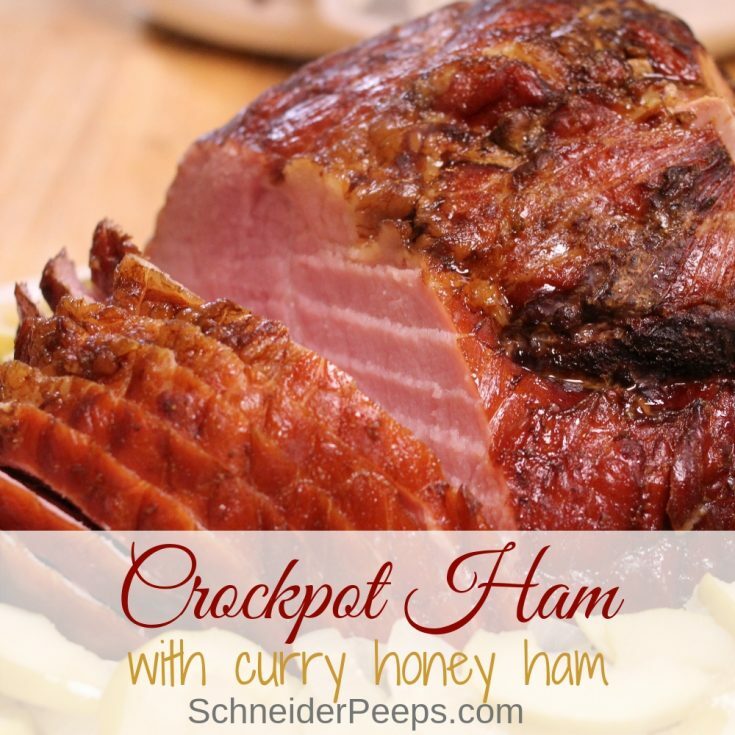 If you’ve never made a ham in the crockpot, I want to encourage you to try it. It’s super easy! Unwrap the pre-cooked ham and put it in the slow cooker - be sure to include the drippings from the bag. Mix the curry honey sauce in a mason jar or large measuring cup. 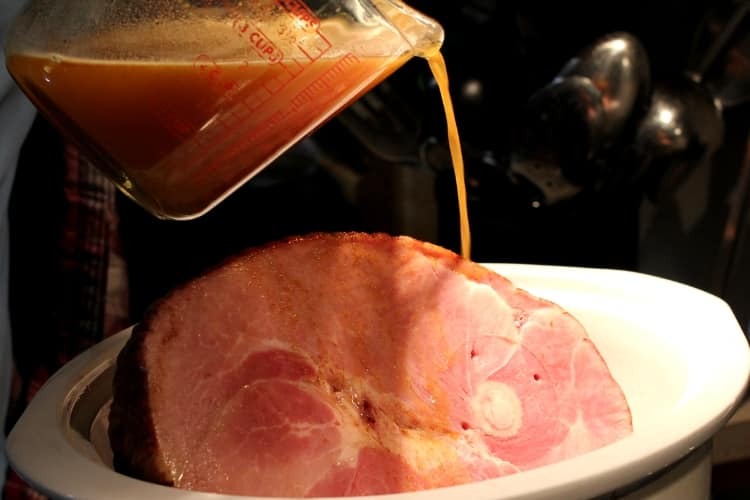 While ham is resting, pour drippings into a pot and bring to a boil. Turn heat to medium and reduce until sauce is thick. This recipe is so very easy to make and is great for dinner on a busy day. It can be paired with roasted vegetables, fried apples and onions, or even served on bread as sandwiches. Once the apples are soft turn off the heat and crumble the bacon on top.